This handsome, 34-story mixed-use tower at 16 West 40th Street was erected in 2017 by the HFZ Capital Group of which Ziel Feldman is a principal. Mr. Feldman’s other Manhattan projects include several of the city’s most attractive pre-war residential buildings such as the Belnord at 225 West 86th Street, the Marquand at 11 East 68th Street, the Chatsworth at 340 West 72nd Street and the Astor at 235 West 75th Street. The building, which is known as The Bryant, was designed by David Chipperfield Architects and was a long vacant site on one of the city’s most impressive blocks. Mr. Chipperfield’s other projects include the lovely pancaked America’s Cup building in Valencia, Spain, for the 2007 yacht race, the Figge Art Museum in Davenport, Iowa, and the BBC Scotland building at Pacific Quay in Glasgow. With Julian Harrap Architects, Mr. Chipperfield restored in 2009 the World War II ruins of the Egyptian Museum and the Museum of Pre- and Early History on Spree Island that was originally designed by Fredrick August Stueler to extend the Altes Museum designed by Stueler’s teacher, Karl Fredrich Schinkel on Museum Island in East Berlin. Stonehill & Taylor are the architects of record for The Bryant. It is across from 40th Street from an entrance to Bryant Park behind the New York Public Library. It will have 57 condominium apartments on floors 16 through 34 and 215 hotel rooms on floors 2 through 15. HFZ purchased the site in 2010 for about $46 million out of foreclosure and some of its partners in 2013 sold their stakes for $83 million, according to an article by Adam Pincus in the February 4, 2014 edition of therealdeal.com. The article said that the project’s financing included a large amount of funds from foreign investors seeking permanent residency through a minimum investment of $500,000 through the U.S. Citizenship & Immigration Services’ EB-5 program and that HFZ received $52.5 million of the total project cost of $252.8 million through the EB-5 program. The Starwood Capital Group had announced in 2007 that it intended to open a “1” Hotel in a tower planned for the site that had been designed by Morris Adjmi, but when that project collapsed the site was sold to the Feldman Group. 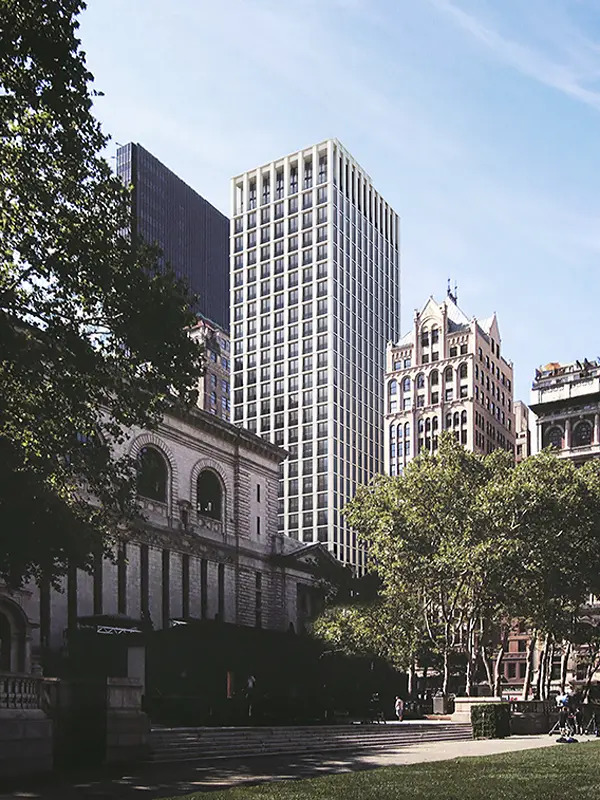 A simple, modern, luxury, mixed-use tower on the south side of Bryant Park and the New York Public Library with tall, inset windows in a grid and hotel service. The tower has aggregate terrazzo façades. The building has a short wing on its west side but otherwise has no setbacks and its grid fenestration pattern is consistent until the top three floors. The tall windows have discrete Juliet balconies of vertical grills. Apartments begin on the 16th floor above a luxury hotel. The building has a 24-hour attended lobby, a fitness center, a Terrace club with fireplace and full bar and hotel services including room service and housekeeping. Pets are allowed. Penthouse B is a triplex unit with 4,078 square feet with a private elevator, a 20-foot-wide living room with 11-foot-high ceiling that is divided by a full-height, gorgeous red jasper gas fireplace wall from a 30-foot-long dining room/kitchen with an island and a 13-foot-wide prep kitchen and a 60-foot-long, double-height loggia that faces south on the lowest level. The middle level has three bedrooms with a marble-clad fireplace in the master bedroom and a free-standing hand-carved Statuarietto marble tub that is not placed full in a window. the top floor has a 16-foot-wide solarium with “a summer kitchen” and a 63-foot-long roof terrace facing south. The unit has radiant heated floors with fumed oak millwork. The kitchen has Sub-Zero and Gaggenau appliances and wine storage. Apartment 30A is a four-bedroom unit with 2,707 square feet with an entry foyer that leads down a hall to a 29-foot-long living room with an open and windowed kitchen alcove with an island. Apartment 29C is a two-bedroom unit with 1,329 square feet with 9-foot-6-inch ceilings with an entry foyer that leads to a 24-foot-long living room with an open kitchen with an island. Apartment 24D is a one-bedroom unit with 1,067 square feet.